There is something to be said about limits. After today, I believe the sky is the limit for our quest to have Child to Parent Violence/Abuse recognized as a form of domestic violence, and to get the legislation in place that we need to have effective programs to help families that so desperately need it. On July 11, 2015, our organization, The Morning After Center for Hope and Healing, Inc. (TMAC), held its first annual Riding4Rose, a fundfraising cycling event named for Rosemary Slaughter-Pate. On July 15, 2013, Rosemary, a 28 year Lockheed-Martin employee, was brutally murdered by her son, Everett Pate, Jr. following years of abuse from him. On occasion, Rosemary would reluctantly seek help and advice from friends. The advice was insensitive and made her shut down even more, so the secret remained between her and her sister, Alice. When the situations turned violent, she would call law enforcement, only to be told everything “looked fine” and they would leave. In the event there was evidence that he’d done something wrong, he would be removed from the home, and Rosemary would have a moment of peace, only to be called and told that although she was the victim of the abuse, under current Florida law, she was still responsible for her minor child and she would have to pick him up. Rosemary did the only thing she felt she could. She installed a steel door in her bedroom with military style locks to create a safe room from her son’s rages. It is the very room that he killed her in. It sounds like something that could never happen to someone like Rosemary with her ever-present smile and giving and selfless nature. However, little did we know, there were many, many parents in situations far too similar and getting the same results when reaching out for help. We decided that we could not sit by and let another family endure the absolute non ending pain that our family has. We began to reach out to Florida state legislatures to let them know what Child to Parent Violence/Abuse is, and let them know families are in desperate need of intervention and programming. The bill has been sponsored by Florida State Senator, Geraldine Thompson two years in a row. We have a page on Facebook (Parent Abuse) and hold monthly Meetups so parents have a safe, judgment-free zone where they can share their stories without stigma or shame. Riding4Rose let me know that there is something special happening. There were more than 40 cyclists there, most of whom knew Rosemary. In addition to individual support, businesses in Winter Garden offered support for Riding4Rose. Sponsors included Bravo Supermarket, Winter Garden Bowl, Gracie’s of Winter Garden, Rhino Pest Control, and Mooncricket Grille. 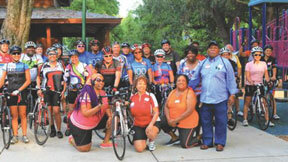 Not only did riders from Central Florida participate, there were riders from as far away as Jacksonville and Ocala, FL. David Sanborn, owner of David’s World Cycle, along with a dozen other riders, biked from College Park to Winter Garden to participate. There is no way we could have predicted the success of this first-time event, and it lends to the life Rosemary led and the legacy she left behind. All in all, the event raised nearly $2,500. There is still so much work to be done. Our goal is to provide education, awareness, and programming so that the suffering will end. Funding is still desperately needed to continue to forge a path toward help for families and to help create an alliance of community partners to service those that need help. To donate, please visit www.themorningaftercenter.org. For more information, please email themorningaftercenter@gmail.com, or call Alice Flowers at (321) 229-7688 or Tiffany Kelly at (772) 708-4759.